The 2018 Queens Baseball Convention is happening next Saturday, January 20th. 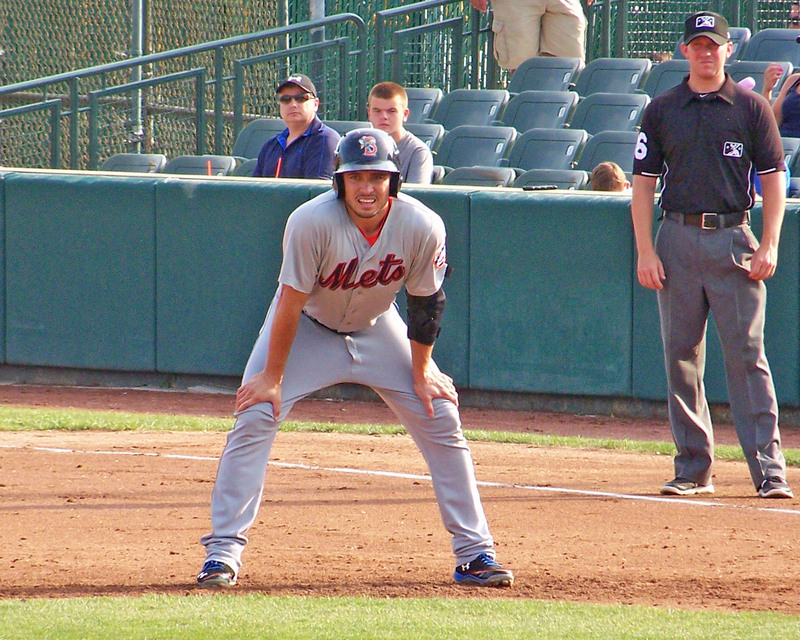 Developed as a fan-run fanfest for the New York Mets, the QBC offers us a chance to get excited about baseball again during a long, cold winter. Current Mets players Brandon Nimmo and Chris Flexen, and former Mets star Todd Hundley will be holding panels and signing autographs. Mr. Met will also be making an appearance. Gary Apple and Jon Harper will host a live (non-televised) version of SNY’s Hot Stove show. There will also be vendors and more. I’m planning to spend next Saturday at Katch Astoria. There are still a limited number of tickets available at www.queensbaseballconvention.com. If you see me there, please say hi. My friend Greg sent me some assorted Florida State League souvenirs this week… some baseballs, ticket stubs, and a pair of baseball cards from the 2014 Florida State League Top Prospects set. 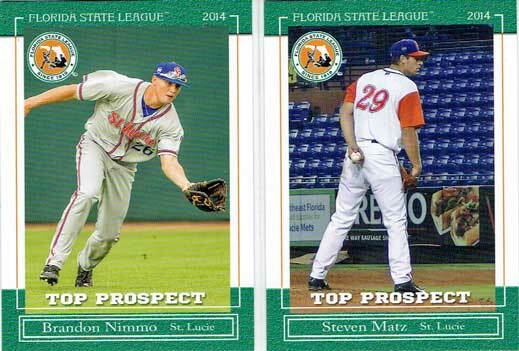 Each Florida State League team had a pair of prospects featured. Outfielder Brandon Nimmo and pitcher Steven Matz represented the Mets organization. Nimmo is a name we might talk about in Feburary and March if the Mets don’t re-sign Yoenis Cespedes this winter. Otherwise, it’s hard to see how he could fit into the major league outfield picture before next September. Fortunately, the Nationals weren’t able to take too much advantage of those recent Mets losses. And the Dodgers have been playing .500 baseball over their last ten games, so the Mets still have a real shot at home field advantage in the first round of the playoffs. Nimmo’s caught in an awkward lunge for a ball in his baseball card photo… it’s a break from the posed shots and the standard “action” photos of batters in their stance and pitchers in their set positions that we see on a lot of minor league baseball cards. But it’s also a reminder of how many action shots can make baseball players look goofy. Matz’s photo is a wonderful glimpse of the world of minor league baseball. If you’ve only been to major league games, it’s probably hard to imagine all those empty seats at the field level of a ballpark. But particularly on school nights in April, May and September, you will see a lot of empty seats at minor league games… even the ones in those first few rows. And it’s really fascinating to be able to hear the umpires make their calls and the bench jockeying that goes on when players and coaches don’t like them. 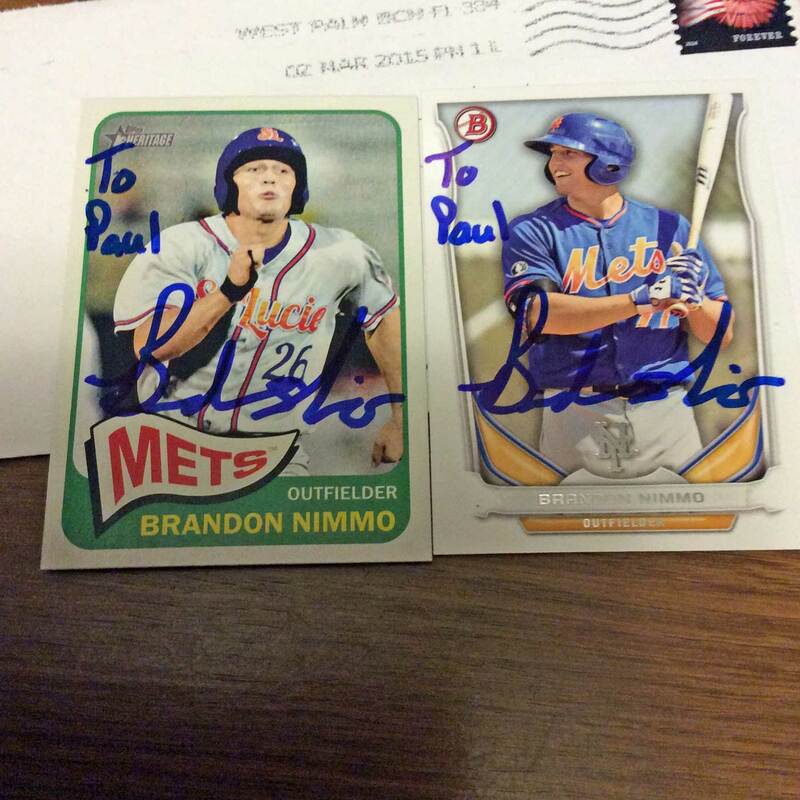 Continuing on with the signed cards I’ve gotten back from MLB spring training camps in March, we’ll start off with my first (and to date only) Mets player, outfield prospect Brandon Nimmo. 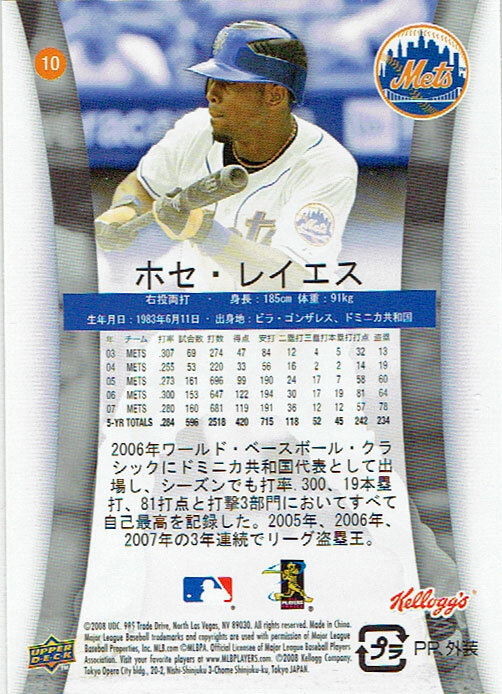 I have a number of Japanese baseball cards in my collection. Most feature Japanese players who signed with the Mets or North American players who went on to play in the Atlantic League. Until recently, I didn’t have any Japanese baseball cards of Major League Baseball players… it just never occurred to me to look for them. Earlier this month, Kenny posted scans of some cards he picked up during a recent trip to Japan (link potentially NSFW due to scans of bikini model cards) at his blog, Torren’ Up Cards. 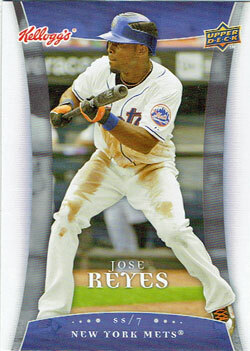 Among the baseball cards were some produced by Upper Deck for Kelloggs in 2008, and I noticed a partially obscured Jose Reyes card in the image. I left a comment hoping to get a better look at it in a future post, and before you know it Kenny sent me a copy for my own collection.